Yesterday was the first day of spring, but you'd never know it around here. We've been having a brutish winter that will not end; yesterday we were treated to an ice storm, making everything slick and glassy, following by driving rain, which made it all the slipperier. Now it's snowing. 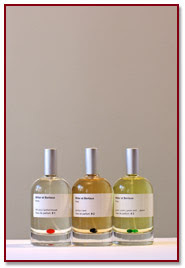 So I took matters into my own hands yesterday, breaking out the spring scents and trying to will spring into appearing. It didn't work, but I felt a little better. A little. Springtime scents are green and fresh; they evoke the possibility of new life. If there's still snow on the ground, they remind you that it won't last forever, that life will be returning to your barren patch of earth. When I wear them at a time like this, I can actually believe that the ground will be thawing and the crocuses will be showing their heads some time soon. 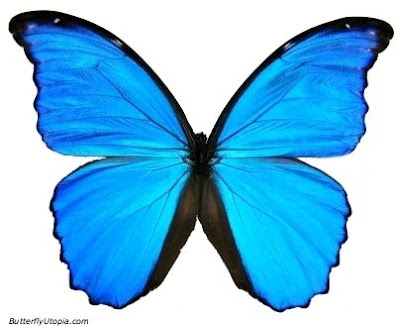 Naturalist David Rooks called the blue morpho butterfly "the bluest thing in the world"
and if you're stuck inside on a hideous, icy, faux-spring day, then Green, green, green and green by Miller and Bertaux is the greenest thing in the world. It bursts out of the bottle--flings itself out--in a tumult of greenness: a sprightly, bitter gin-and-tonic smell with a big wedge of lime and a camphoraceous leafiness at the same time. There's nothing pretty or understated about it: it's just a full-frontal assault of green. and aren't they great? Like little tiny wardrobes! A few other fragrances that say "springtime" to me, scents that I will be counting on to get me through days like this: Demeter Meyer Lemon, the dark-green Cabochard and Jacomo de Jacomo for those overcast days, Lagerfeld Photo, and of course Yves Rocher Homme Nature, which has been my go-to spring scent for years. 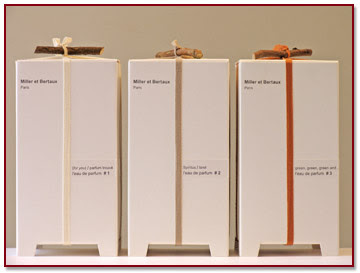 I really like the Miller et Bertaux line - I have the first three fragrances and wear them quite a lot. Nice review on Green, green, green and green - I, too, get that great lime at the beginning that never seems to go away (at least on my skin). Although, as you mentioned, it doesn't develop much, I love it for it's tenacity.